The Fall rains have arrived in Salem, but happily last Sunday was beautiful and I got most of my pictures for this post that afternoon. 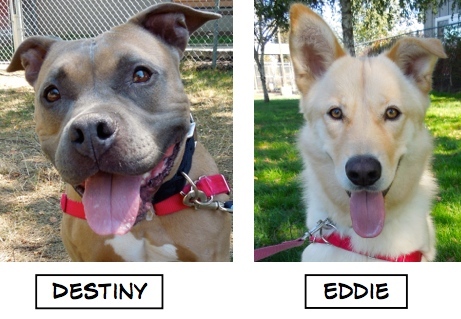 There were many new dog adoptions during last week and here are the Blog Dogs who went to new homes. 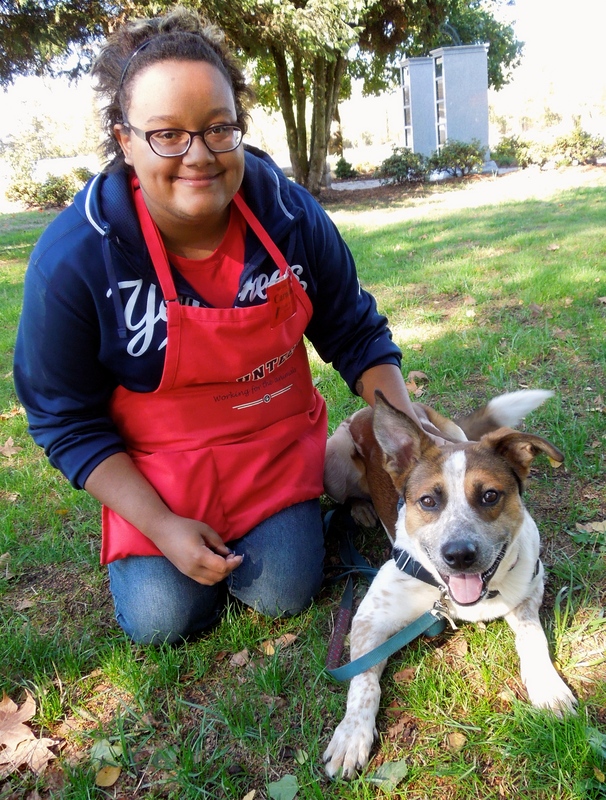 I was especially excited about Destiny’s adoption by a WHS staff member. She’s had a rough life in the past and now she has hit the adoption jackpot! 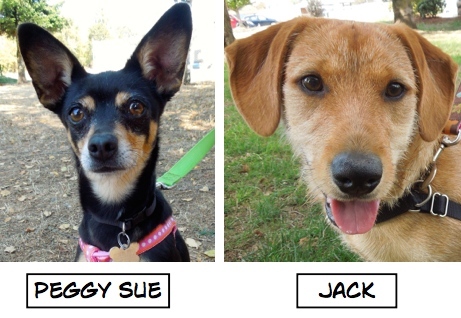 Sunday’s play group was happy and full of pep. 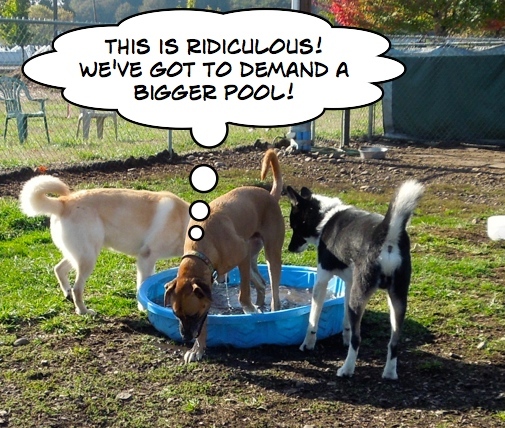 There was a complaint, however by Rocky, who disgustedly left the pool when it got crowded. 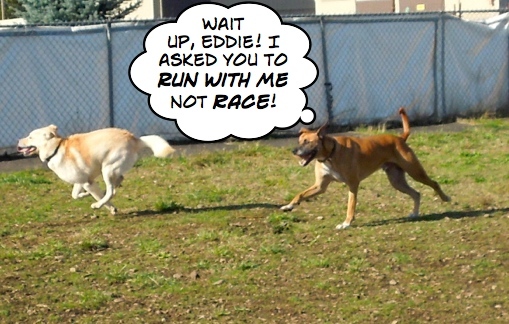 Rocky and Eddie had a great time romping around the big yard. Eddie was a newbie and I was trying to take some pictures of him, when this happened. 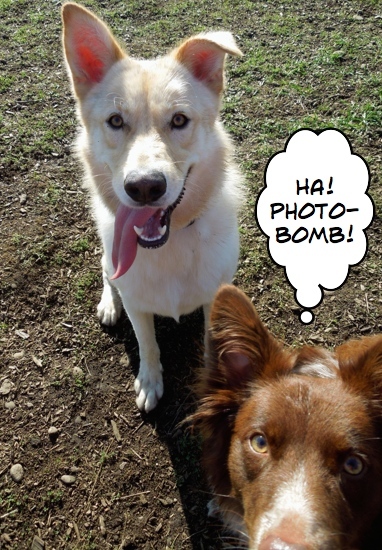 Sydney, the photo-bomber, belongs to volunteer Ryan and couldn’t understand why I wasn’t taking pictures of HER. 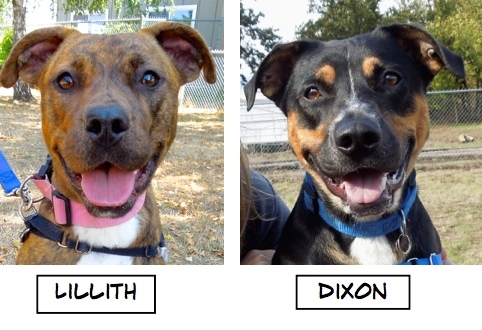 I love play group, but I’d really like a family to play with! 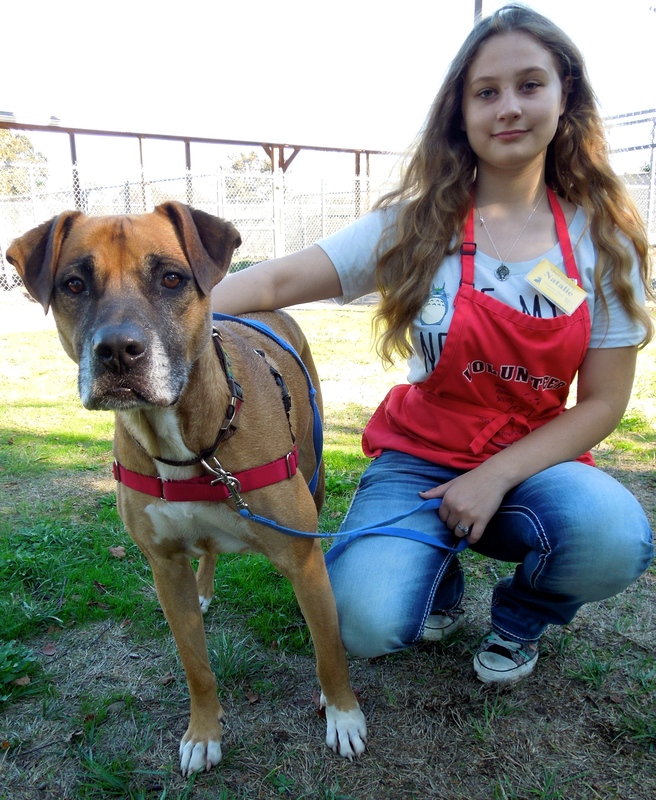 Rocky is a six-year-old Rhodesian Ridgeback/Boxer mix. At 83 pounds, he’s a big, loveable boy. He’s been waiting at WHS for a month. While he loves to race around the yard with his friends, he also enjoys leisurely walks and relaxing with his people in the evening. He is house-trained and knows several commands. He will make a great dog for a family with older kids. Here he was on Sunday with Natalie. Here he is looking a bit less serious. I’ve been waiting, waiting, and waiting for you. 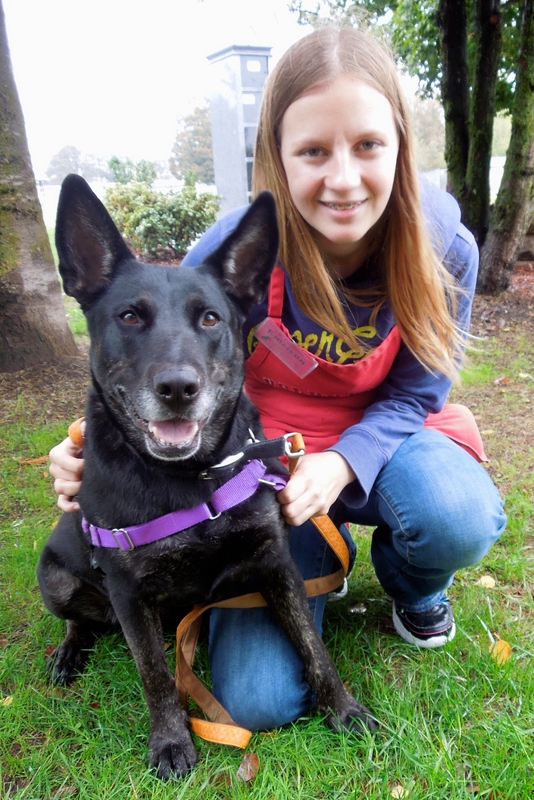 Sarah, a six-year-old Lab/German Shepherd mix, has also been waiting for a month for a new home. 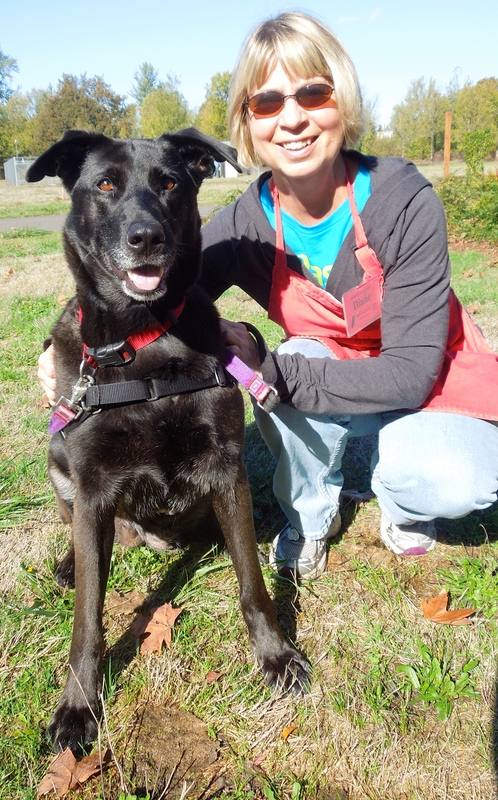 She loves people but is not fond of other dogs or cats, so she would do best as the only pet in the home. She weighs 84 pounds. We volunteers have become very fond of this older girl and hope she will be found by her forever family soon. Here she was Sunday with volunteer Diane, one of her many fans. I love her smile! Here she was today on her walk in the rain with Steve. 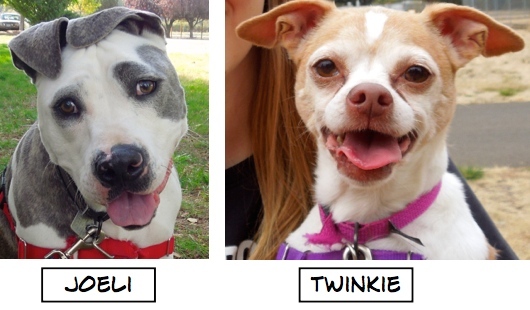 I have a new name and am enjoying a temporary home…but I need a forever one! Remember Springer? I took lots of pictures of this eager boy. Here is one of my favorites. 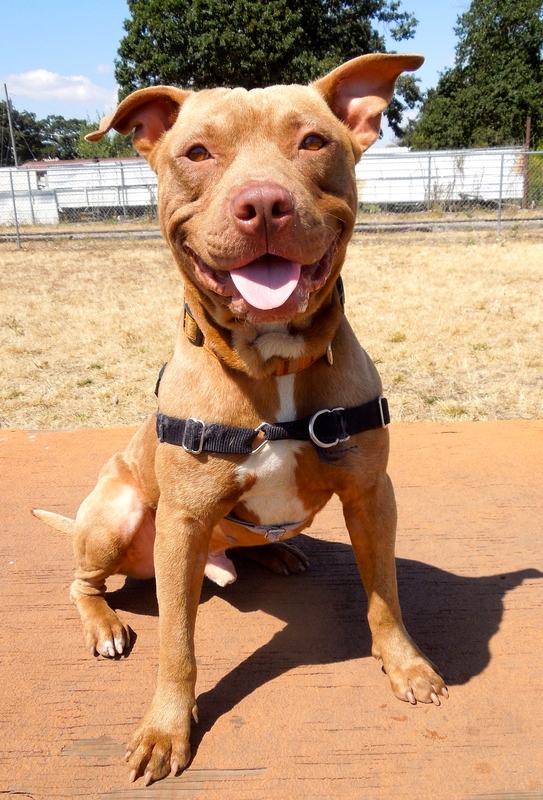 He is a one-year-old Pit Bull Terrier mix. Springer was finally adopted, but it was not the right fit and he was returned to the shelter with the new name of Oscar. 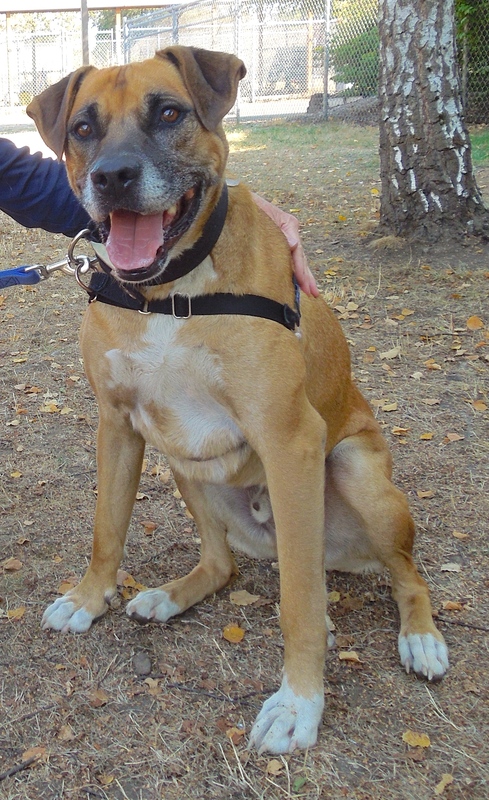 Because he had been feeling very stressed in the kennels before he was adopted, he went to a foster home. This week his foster mom asked if I would feature him on my post. 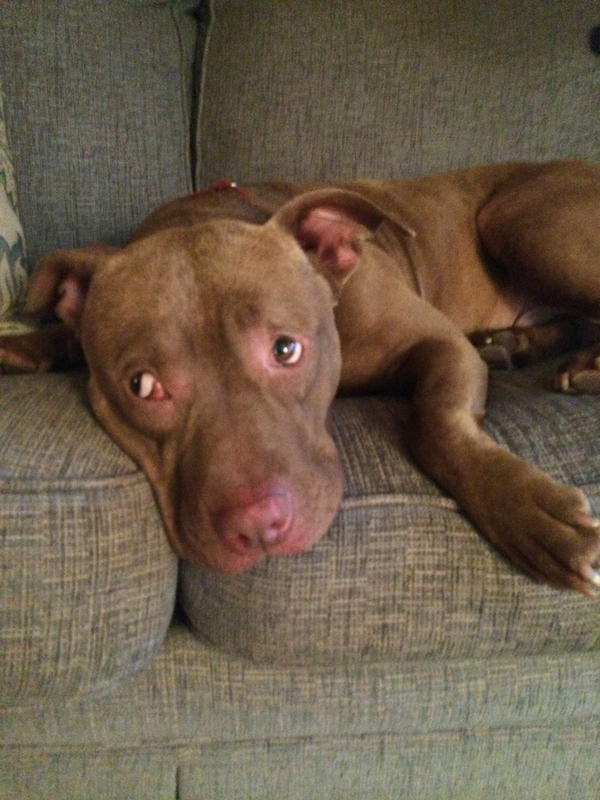 I am so happy to have this wonderful update about how Oscar is doing in his foster home. “Oscar lives with me as a foster dog along with my 12-year-old lab, two cats, husband and two kids (ages 7 and 10) and WHS foster kittens! Oscar is the biggest sweetheart in the world. He is truly a Pit Bull that you can call a “breed ambassador.” He walks well on leash, doesn’t react to other animals, and is sweet and loving with people. He’s got it all! His top loves in life are 1) people and 2) food. 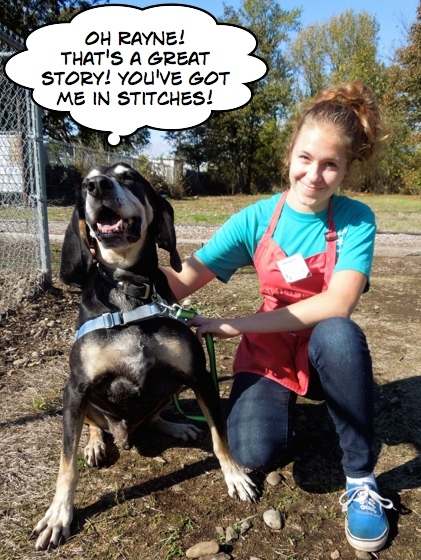 He is wonderful with cats and other dogs, but doesn’t really care about them, he just wants to be with his people! 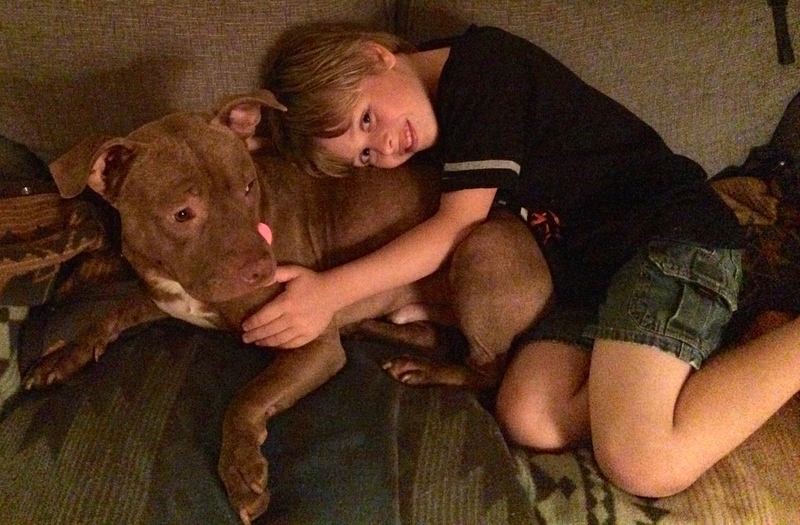 Oscar bonds tightly to one person and is affectionate with the other family members, but clearly has a favorite! He wouldn’t be a great dog to adopt as a companion to another dog, since he wants to be BFFs with a person, not another animal. He is so sweet with children! Although he is a very mellow dog, he does get a little feisty and rambunctious at times and steps on toes or accidentally knocks them down, so he’d probably be best in a home with kids over the age of 8. Oscar is a medium energy dog. He is not at all hyper and seems to do just fine with about 30 minutes of walking a day. He will join you for a jog if you want, but does not need this kind of intense exercise. 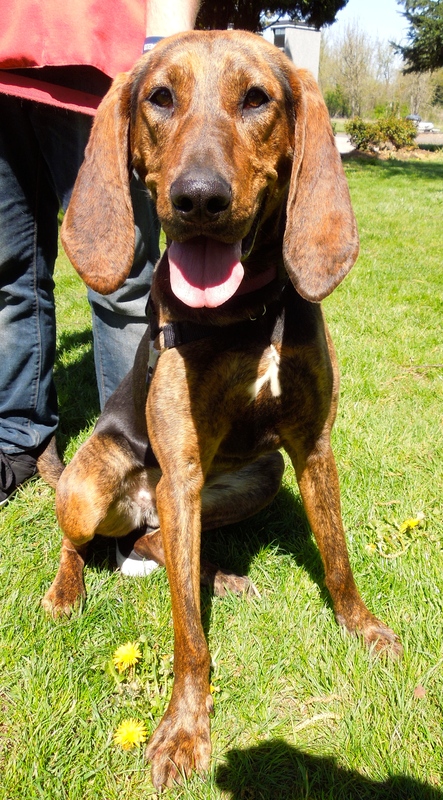 He’d be great for a family who doesn’t want a super high-energy dog. He would rather lean on you and get petted than play fetch or tug-o-war. Oscar has not had a great life so far and despite how sweet and wonderful he is, has been in at least 3 homes. As such, he does not like being left alone. We are working on crate training but he is not the kind of dog who you can leave for 8+ hours a day to go to work. He would be miserable. Although he is not destructive at all (he isn’t interested in chewing) he may try to escape to find you! He is a bit of an escape artist. 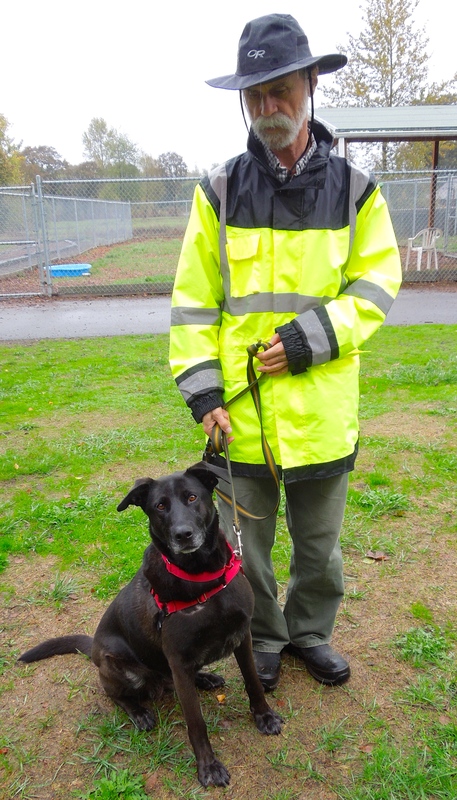 Oscar is working on basic obedience and is great on leash. He knows “sit” and “down,” is working on “wait,” “stay,” “bed,” “crate,” and “off.” He is extremely smart and treat-motivated and so he is a very fast learner! He rides extremely well in the car and would do wonderfully with an adoptive family who wants to take him places, works from home, retired or just home a lot. We are working on his socialization as some things that he hasn’t seen before scare him—things like loud children at the park, children on swings, etc. He tries to get away from these things, and so he could use some help understanding that unfamiliar things are not scary. 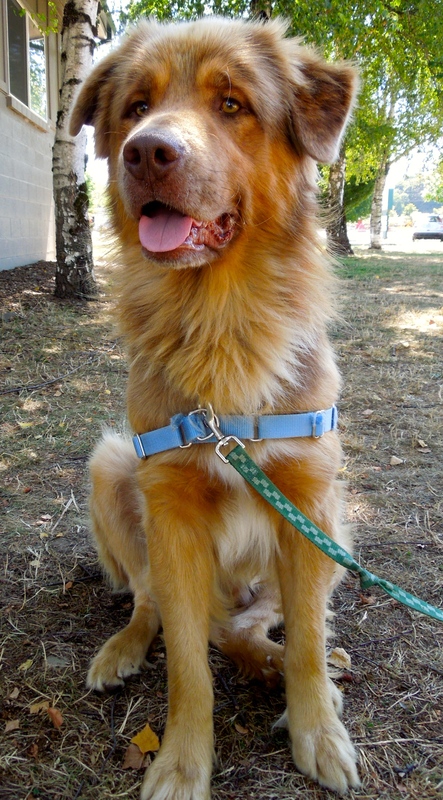 If you want to meet Oscar, please contact the WHS Foster Coordinator (503) 585-5900 x 303. Here are some home pictures that Laura sent. We’re all hoping that Oscar’s people will find him soon. I am looking for my just-the-right-fit of a family! Nico is a dog with some special needs so will require a dog-experienced family who can give him the structure and help with those needs. 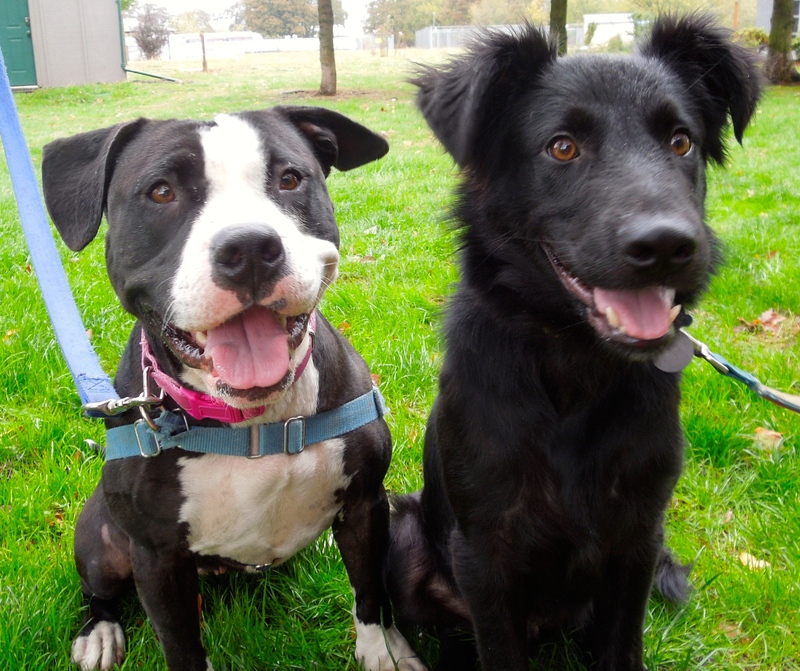 Nico is an Australian Kelpie/Pit Bull Terrier mix. 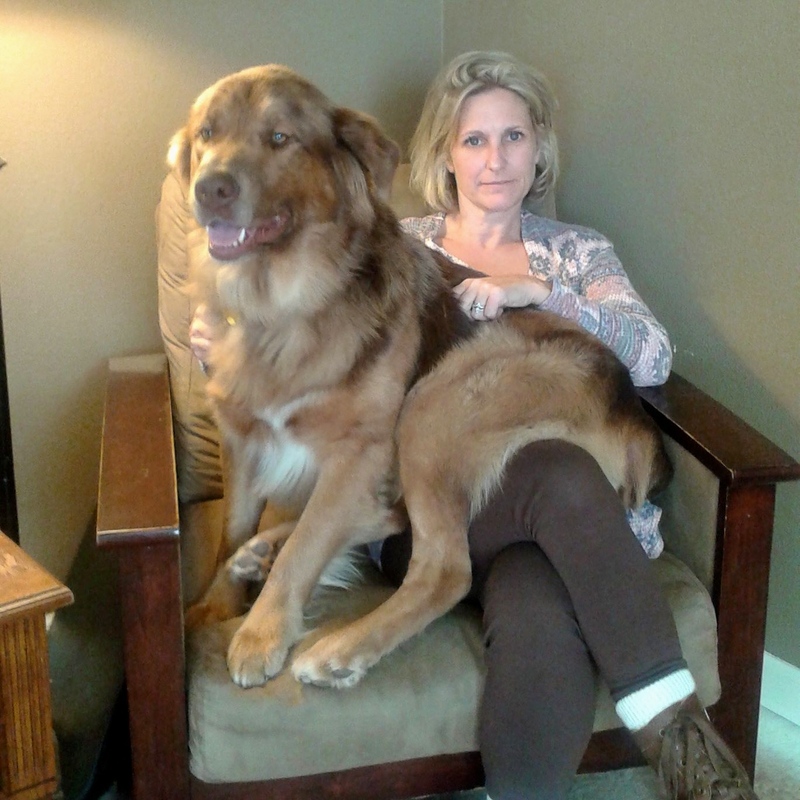 He is two years old and weighs about 50 pounds. Nico has to have a home with no cats. He has been known to climb a six-foot fence, so secure fencing will be a must. He is very energetic and is looking for an active family with kids at least 13 years old who will be able to handle his enthusiasm. Nico also needs a little help with polishing his house training. With all of this said, Nico is very smart and likes spending time with people. He is picky about his dog friends, but on Sunday had a great time with a staff-member’s puppy. 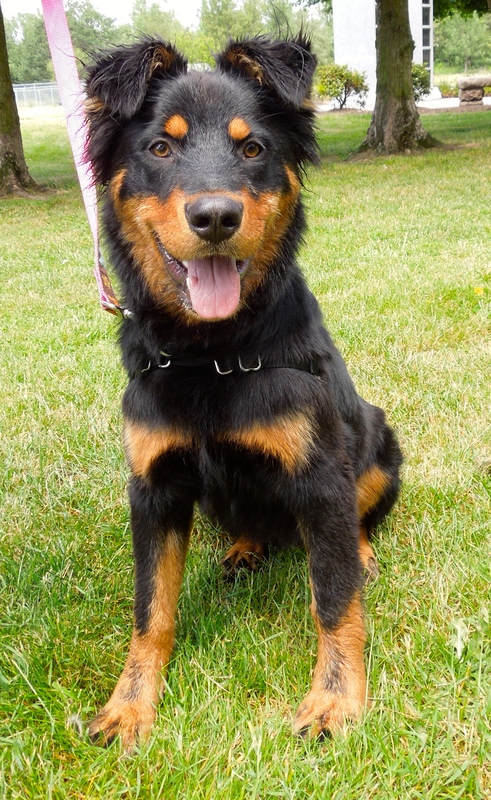 Nico would enjoy and do well in training classes that work on impulse control and manners. A dog like Nico, who needs a family with experience and certain skills, has a difficult time finding it. Nico has been waiting at WHS since July. I’m hoping his wait will soon be over. Here he is enjoying some down time with Alexis. I’m Caroline’s favorite! I could be YOURS, too! 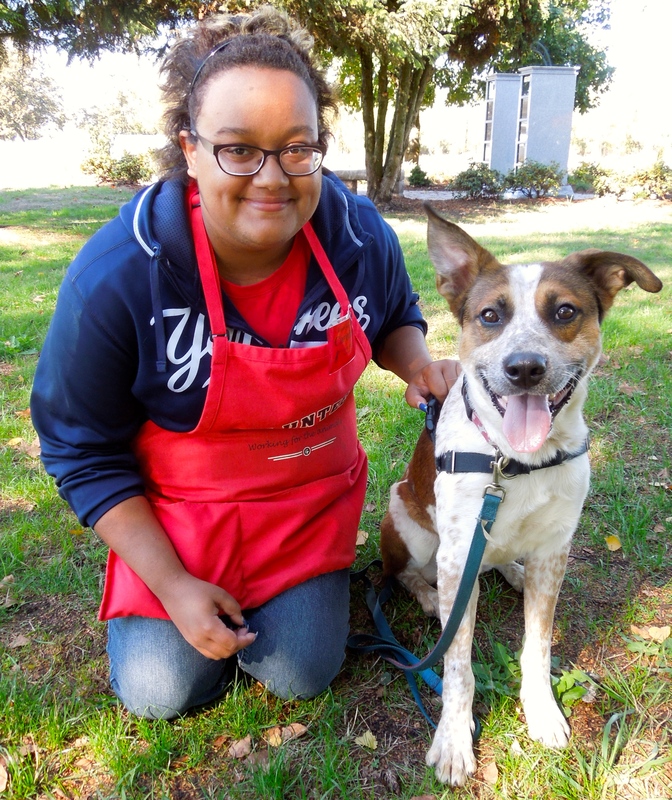 When I asked volunteer Caroline to go get her current favorite dog for a picture for my post, she immediately jumped up to get Samson, a one-year-old Australian Cattle Dog. He is quite timid at first meeting and is a bit nervous around new things. 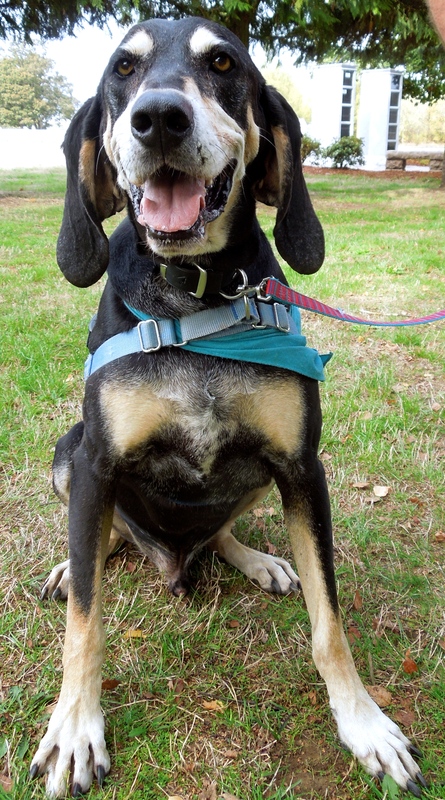 He’s looking for a calm but active family who will continue to help him gain confidence. Samson is smart and eager, taking my hot dog bits politely. He knows some commands and is house-trained. He would prefer to be the only dog in the family and would do best with older kids. 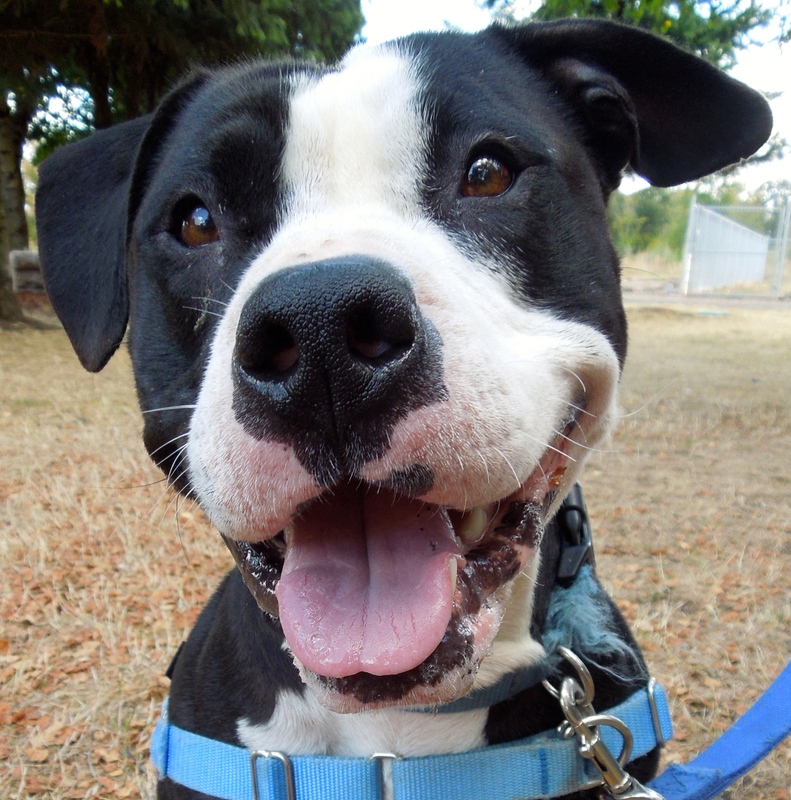 Samson loves to run and would make a great jogging or hiking partner. Caroline is hoping he’ll soon be found by a family wanting a new best friend. I’m finally adoptable! Come and take me home! I’ve been waiting and waiting for Angel to reach the adoption floor. She’s a four-year-old Pit Bull Terrier mix who came to us in July with an open wound in her side, so wasn’t ready for adoption until it healed. She is now in tip-top shape and ready to go home with an active family who will keep her supplied with tennis balls. Volunteer Francis is one of her biggest fans. 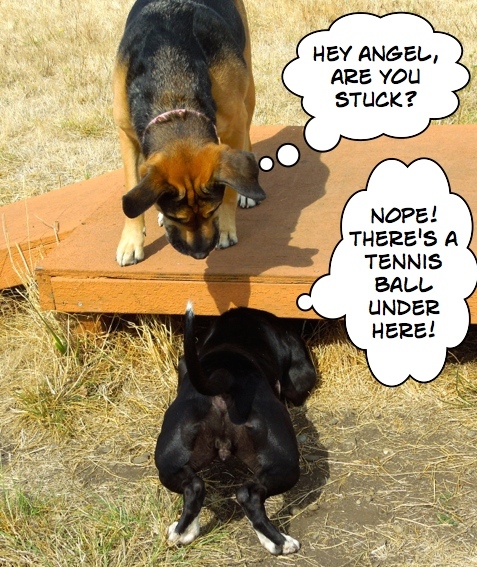 You won’t have to worry about ever losing a tennis ball with Angel around. This girl will find a tennis ball no matter where it is! To say that Angel loves to play fetch with tennis balls would be an understatement. This dog can cram two tennis balls into her mouth and will try for a third. She has tried to eat a hot dog treat WHILE keeping a tennis ball in her mouth. 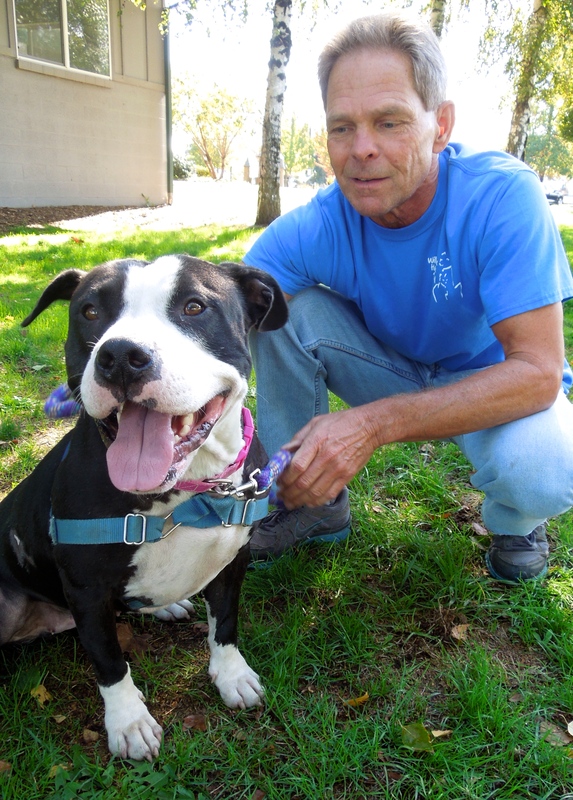 Angel is a happy, affectionate, eager girl. She is house-trained and knows several commands. She does need work in polite leash walking. 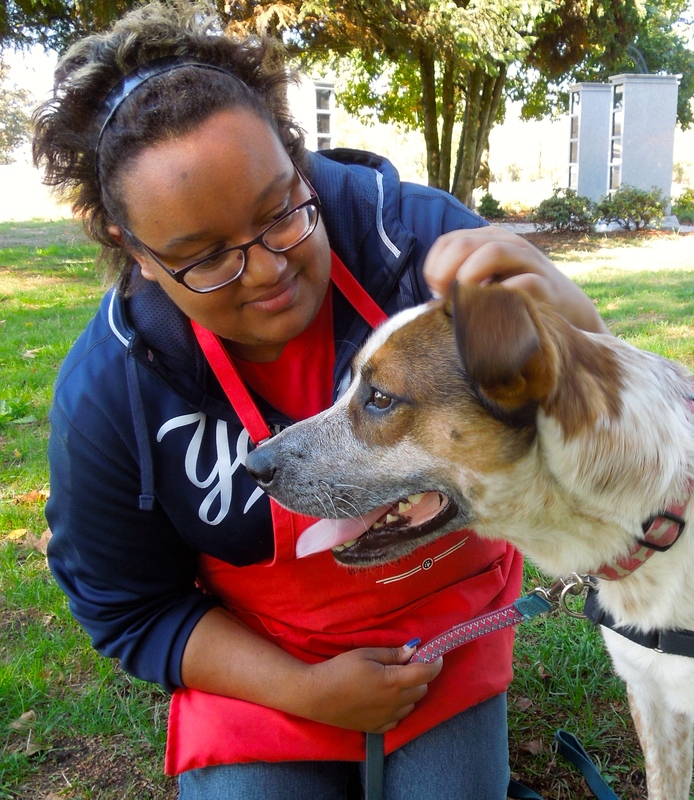 Since she has been at WHS so long, she has become quite the favorite of many volunteers. Now that she can be adopted, we hope she won’t have to wait much longer. I’m very shy but I get brave when I have my guardian Angel with me! Courage, a name he will hopefully grow into, is an eight-month-old Retriever puppy who is extremely timid, but oh, so cute! 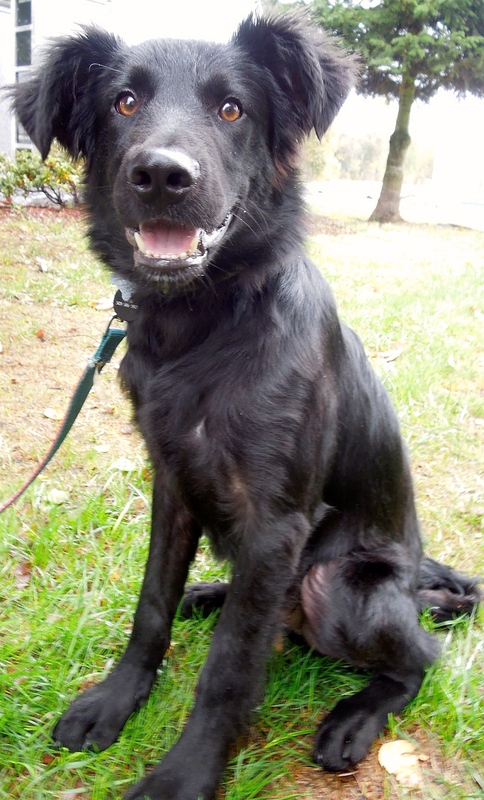 He is looking for a gentle family who will help him to gain confidence and teach him that every new thing isn’t scary. Courage is so nervous that it is difficult to coax him out of his kennel to go outside— unless his most favorite dog in the world, Angel, is there. Then he happily exits the building and the two of them eagerly take treats and pose for my camera. Pit Bull Terriers have long been called “nanny dogs” because historically they have been so good with children. Courage will definitely expand that to puppies. Need a play group monitor? I’m up for the job! Oh, how I love this Hound! If you are looking for a dog with personality, a big heart, a great sense of humor, and you don’t mind an occasional howl, then Copper is the boy for you! 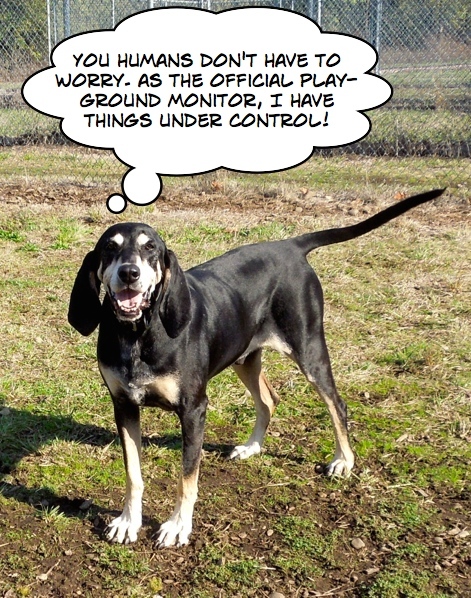 Copper is a twelve-year-old Coonhound, but you’d never guess his age. He’s still very energetic and loved thinking of himself as the boss of play group. He didn’t howl unless he felt it necessary, which wasn’t often. He keeps you laughing with his antics and loves attention. I’m hoping potential adopters won’t be put off by his age. This guy has a lot of living yet to do and needs a loving forever home. He’s one of Rayne’s favorites, too! I bet you would love me like Rayne does! I wrote about Cutter last week, but couldn’t resist this sweet picture with Rayne on Sunday. 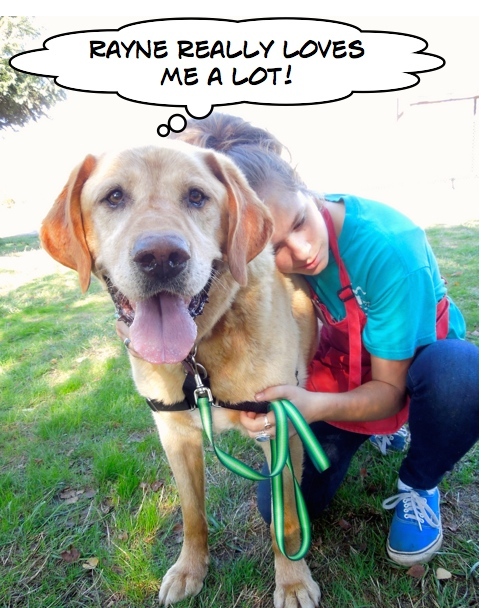 Cutter is an 8-year-old Lab mix and is such a gentle boy. He has been an outdoor dog his whole life and would like to get to come inside in his new home. At 106 pounds, he’d love to have a family who would take him for walks so he could shed some weight, then curl up with them in the evening. Some family will be very lucky to adopt this gentle soul. 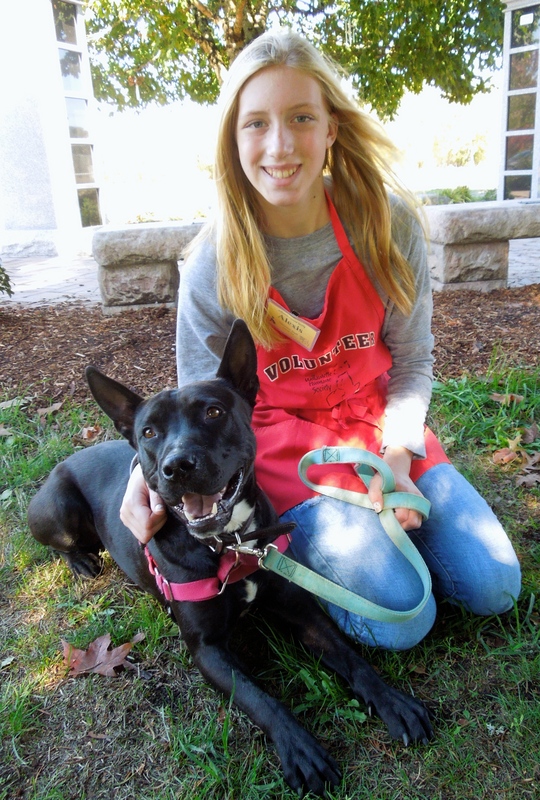 Meet Bella, a five-year-old Dutch Shepherd mix, and currently Emelynn’s favorite shelter dog. 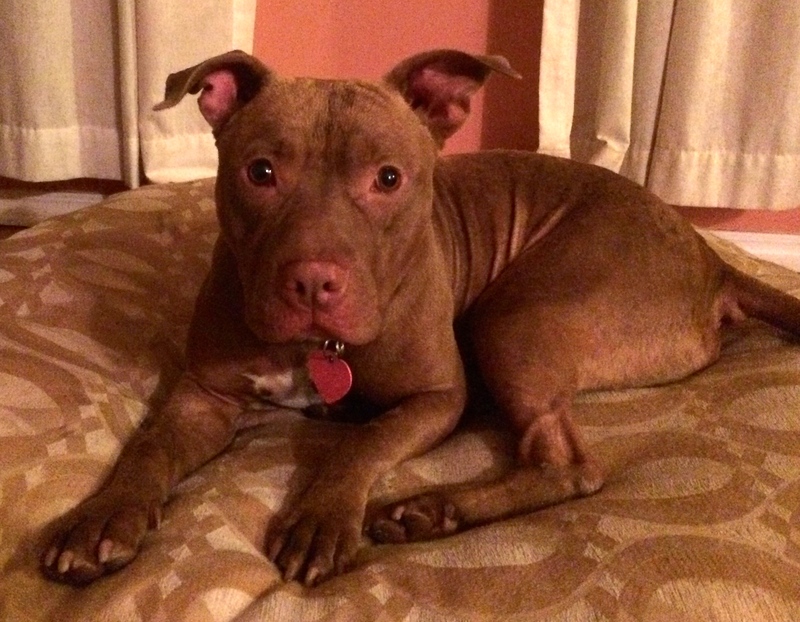 Bella is looking for a fun and active family who will give her exercise and play time. She has a very good history with children, but with her size, she will be best with children over ten. She is house-trained and walks well on leash. Emelynn reports that while she loves to be energetic, she also is a cuddle bug and likes to lean on her people and relax. 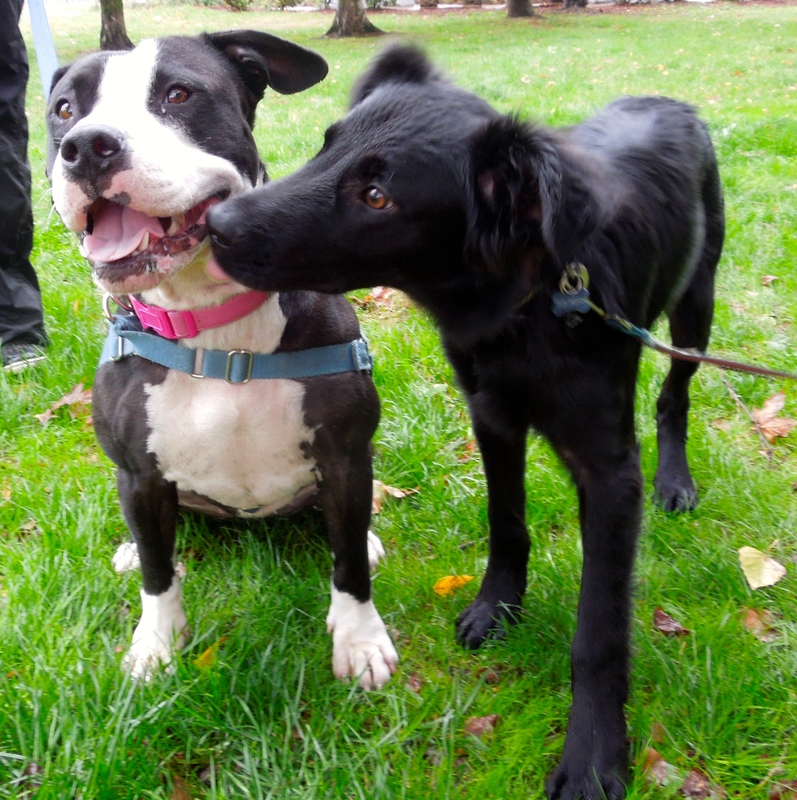 She spent some time in a foster home with two other dogs and a child and was wonderful. 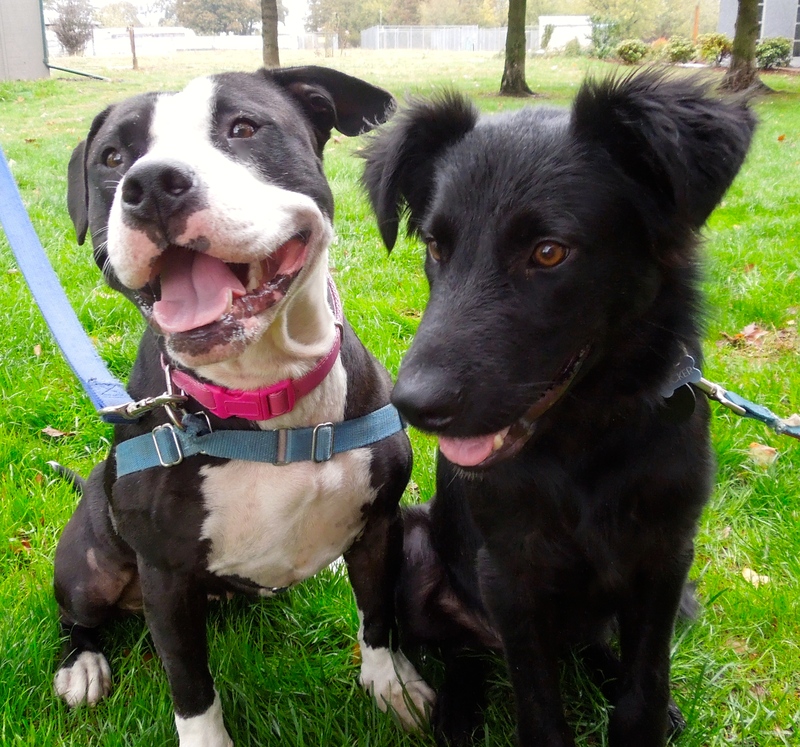 We’re hoping Bella will soon have a home and family of her own. Some of you may remember Scrappy and Gryffindor. 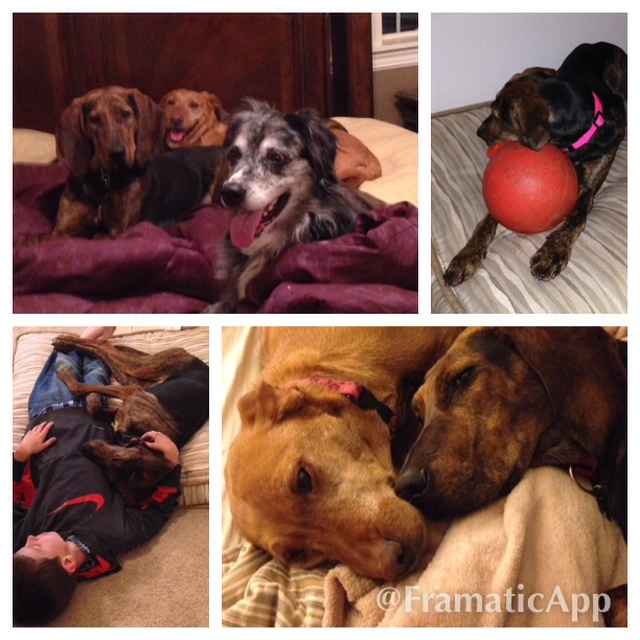 They were adopted into the same family and living the best life ever! Here they were when they were at WHS. And here they are now… both boys are doing great and are very loved. Remember Nana, the wonderful Hound? Here she was at WHS. I was so happy to get this update on her last week! 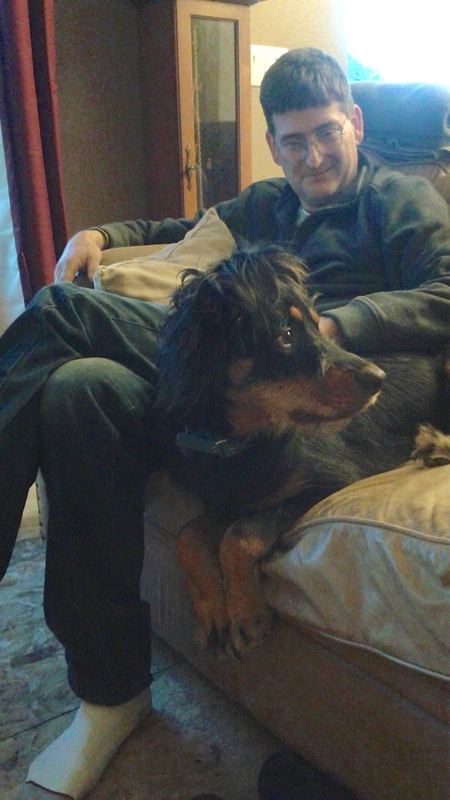 “We have now had Bailey (Nana) for awhile. She has quite the personality. Every morning she flips around on our bed until I rub her belly and under her chin. She also likes to “protest” if we ask her to do something that she disagrees with. She will bark/howl and then begrudgingly abide. We can’t help but laugh when she does this. Her favorite activities include chasing squirrels and tracking scents in the backyard and then barking/howling to inform us. Her training is coming along nicely too. She has really impressed us with her “leave it” skills. We feel so blessed that we didn’t pass her up. We never expected to adopt a hound and it was the best decision we could have made. She is loving, gentle, loyal and absolutely the best family dog.